The six astronauts preparing to blast off on the space shuttleAtlantis Monday have arrived at NASA?s Florida spaceport to prepare for launch. 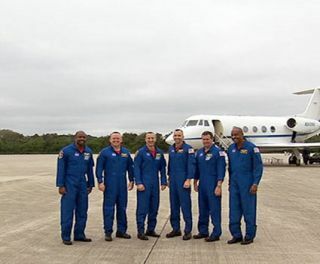 The crewmembers flew to NASA's Kennedy Space Center in CapeCanaveral, Fla., at 12:35 p.m. Thursday on a modified from a Gulfstream jetwith just four days remaining before their planned launch into space. "It?s a real honor and pleasure to be here,"commander Charlie Hobaugh said just after disembarking. "This has beenobviously the culmination of at least nine months of us being together asa crew." The astronauts are slated to lift off on Atlantis fromLaunch Pad 39A on Nov. 16 at 2:28 p.m. EST (1928 GMT) for an 11-day mission tothe International Space Station. "As we flew in just now we saw the orbiteron the pad, Atlantis looking bright and shiny," said pilot Barry"Butch" Wilmore, who will be making his first trip to space. "This is my second time flying on Atlantis," saidmission specialist Leland Melvin. "It's a great opportunity. We're veryblessed to be here, as well as just to have the opportunity to fly in space." During their STS-129 mission the spaceflyers plan to delivervital spare parts to the station to help prepare for the retirement of thespace shuttle fleet in the next year or so. Three spacewalks are planned. The astronauts are hoping for clear skies next week, sincethey have only a short time range to launch before the shuttle must stand down aroundNov. 19 or 20 due to unfavorable sun angles at thespace station, which can cause heating and power concerns, agency officialshave said. "It?s a beautiful day here in Florida and we're reallyexcited about Monday coming up," said mission specialist Robert Satcher Jr.
Atlantis' liftoff will be the agency's fifth shuttle launchof the year ? the most in a single year since 2002. Video ? The STS-129 Crew Rehearses For Shuttle Flight ?